Strong epidemiological and experimental evidence indicates that hypertension has detrimental effects on the cerebral microcirculation and thereby promotes accelerated brain aging. Hypertension is an independent risk factor for both vascular cognitive impairment (VCI) and Alzheimer’s disease (AD). However, the pathophysiological link between hypertension-induced cerebromicrovascular injury (e.g., blood–brain barrier disruption, increased microvascular oxidative stress, and inflammation) and cognitive decline remains elusive. The present study was designed to characterize neuronal functional and morphological alterations induced by chronic hypertension and compare them to those induced by aging. To achieve that goal, we induced hypertension in young C57BL/6 mice by chronic (4 weeks) infusion of angiotensin II. We found that long-term potentiation (LTP) of performant path synapses following high-frequency stimulation of afferent fibers was decreased in hippocampal slices obtained from hypertensive mice, mimicking the aging phenotype. Hypertension and advanced age were associated with comparable decline in synaptic density in the stratum radiatum of the mouse hippocampus. Hypertension, similar to aging, was associated with changes in mRNA expression of several genes involved in regulation of neuronal function, including down-regulation of Bdnf, Homer1, and Dlg4, which may have a role in impaired synaptic plasticity. Collectively, hypertension impairs synaptic plasticity, reduces synaptic density, and promotes dysregulation of genes involved in synaptic function in the mouse hippocampus mimicking the aging phenotype. These hypertension-induced neuronal alterations may impair establishment of memories in the hippocampus and contribute to the pathogenesis and clinical manifestation of both vascular cognitive impairment (VCI) and Alzheimer’s disease (AD). Zsuzsanna Tucsek and M. Noa Valcarcel-Ares contributed equally to this manuscript. This work was supported by grants from the American Heart Association (to ST, ZT, MNVA, AC and ZU), the National Center for Complementary and Alternative Medicine (R01-AT006526 to ZU), the National Institute on Aging (R01-AG047879; R01-AG038747; P30 AG050911), the NIA-supported Oklahoma Nathan Shock Center (to ZU and AC; 3P30AG050911-02S1), the National Institute of Neurological Disorders and Stroke (NINDS; R01-NS056218 to AC), the Oklahoma Center for the Advancement of Science and Technology (to AC, FD, ZU), the Oklahoma IDeA Network for Biomedical Research Excellence (to AC and FD), the Presbyterian Health Foundation (to AC, AY, ZU, FD), and the Reynolds Foundation (to ZU and AC). 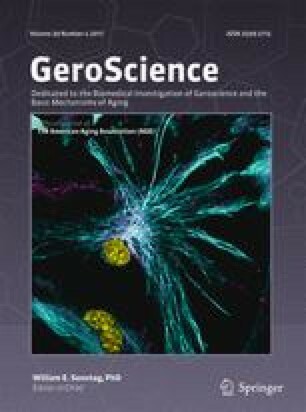 The paper was published as part of the “Translational Geroscience” initiative of the Journal of the American Aging Association (Ungvari et al. 2017a; Bennis et al. 2017; Callisaya et al. 2017; Grimmig et al. 2017; Hancock et al. 2017; Kane et al. 2017; Kim et al. 2017; Konopka et al. 2017; Liu et al. 2017; Meschiari et al. 2017; Perrott et al. 2017; Sierra and Kohanski 2017; Tenk et al. 2017; Urfer et al. 2017a, b; Ashpole et al. 2017; Deepa et al. 2017; Shobin et al. 2017; Podlutsky et al. 2017; Ungvari et al. 2017b). The authors acknowledge the support from the NIA-supported Geroscience Training Program in Oklahoma (T32AG052363), which aimed to facilitate the understanding of the interaction of processes of aging and chronic diseases (Sierra and Kohanski 2017).